Which parts of this agreement do our governments intend to implement? Which parts do they repudiate? Supporters of the UN’s Global Compact for Migration – which will be formally adopted in Morocco next week – are telling two different stories. In one breath they say it’s an historic, unprecedented, comprehensive document that will strengthen migrant rights and make the world a better place. In the next, they say it’s no big deal since it “fully respects the sovereignty” of individual nations. Not everyone is convinced. More than a dozen countries, including Switzerland, Australia, the US, and Russia have reportedly withdrawn from this UN process over concern it will impede their ability to make independent decisions. Right. So why adopt an agreement that declares “We commit to…” 25 times if you have no intention of following through? Is this how international trust gets fostered these days? By nations saying one thing and then promptly reverting to business as usual? The most charitable interpretation is that our leaders view these 34 dense pages of text as a smorgasbord from which to pick and choose. In that case we, the citizens of Canada, the UK, France, and elsewhere have the right to know beforehand which morsels will end up on our plates. Equally urgently, we have a right to know which parts of this feast our leaders repudiate. Does my government affirm that freedom of the press will always prevail no matter what Objective 17 and its sub paragraphs happen to say? Here in Canada, the media is part of a system of checks and balances that holds government accountable. Officials don’t tell journalists how to report on any topic. That’s called state censorship. In Spain a doctor was recently punched in the face at a medical clinic at two in the morning. Last week, the migrant from Pakistan who appeared in court said his religion forbids him from being treated by a woman (see here and here). Lip service is paid to “full respect for the freedom of the media” and the “right to freedom of expression,” but don’t be fooled. Either journalists operate unencumbered, or governments interfere with news outlets by educating, sensitizing, monitoring, and threatening to de-fund. Those two environments are mutually exclusive. 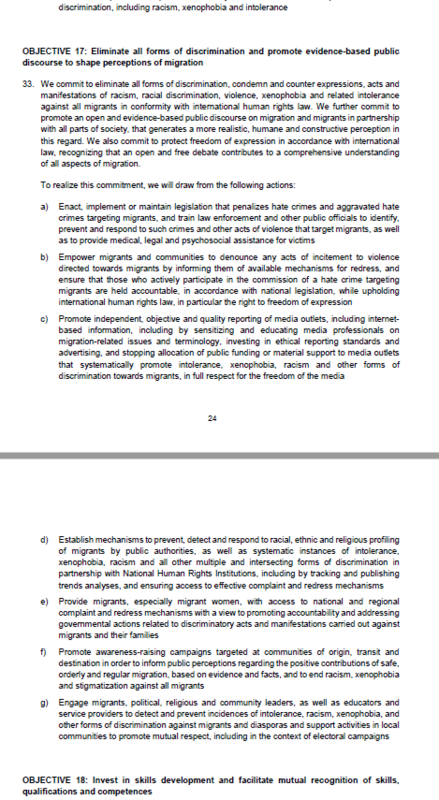 Let us be clear: The Global Compact for Migration normalizes state censorship. This entry was posted on December 5, 2018 by Donna Laframboise in ethical & philosophical, media, money & funding and tagged immigration, media, United Nations.